Happy Monday, friends! I hope you all had a great weekend! 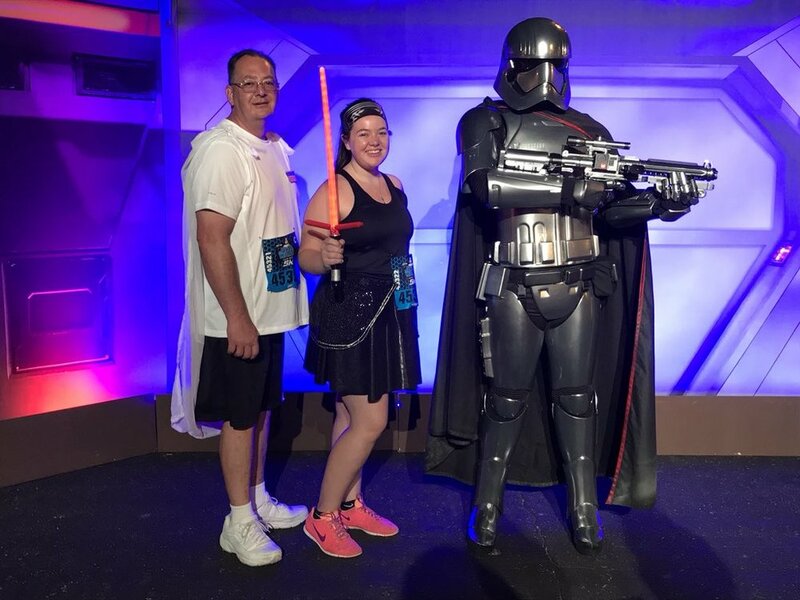 I got to spend my weekend hanging out at Walt Disney World with my family, meeting up with friends, and running in the Star Wars Dark Side Half Marathon. Dark Side is my favorite race that Disney puts on each year and I cannot hype it up enough to people. If you're even a little bit considering a race you're going to want to keep reading. If you've been around for a while then you'll know that the number one thing I HATE about runDisney events is the expo, but this year's Star Wars Dark Side expo was much more organized than last year, and even more organized than Princess Half Marathon Weekend in February. We got in and out of the expo in under an hour, which is a huge blessing if you're asking me. We went to get merchandise first, which was all located in the new flex space right when you walk up to ESPN Wide World of Sports. There was no line to get anything and when we got there Thursday nothing had sold out yet. There were also some really fun photo opps in this area including Jabba! Friday morning my dad and I ran the 5K together. It was super fun and went through Epcot. If you've run the 5K for Princess Half weekend it's the same course. Before the race we got to meet Boba Fett, Kylo Ren, and Captain Phasma! I dressed up like Kyle Ren and my dad was General Krennic. I love the 5K's because they aren't timed so you don't feel like you have to rush and miss any character meet and greets or any other photo opps you might want! Sunday morning I did the half marathon by myself. This was my second half marathon and I definitely felt a lot better about this one than I did my first one. I ended up running in a pace group for about seven miles and that helped a lot. There were two pace groups in my corral and if I run another half marathon I would definitely run with one again. The course for the half started in the Magic Kingdom parking lot, went to Animal Kingdom, Hollywood Studios, and Epcot, then finished in the Epcot parking lot. The course was actually really fun and I liked it better than any of the other courses I've done recently. The medals for this race are probably my favorite medals I've ever gotten! Captain Phasma is my favorite Star Wars character so I loved that the half marathon was themed after her. Then the 5K was a Stormtrooper. The other two medals are a little bit different because one was for a virtual half marathon (the pilot), and the other one was for the Kessel Run Challenge, where you did the virtual half and the Dark Side Half to get the Millennium Falcon medal! 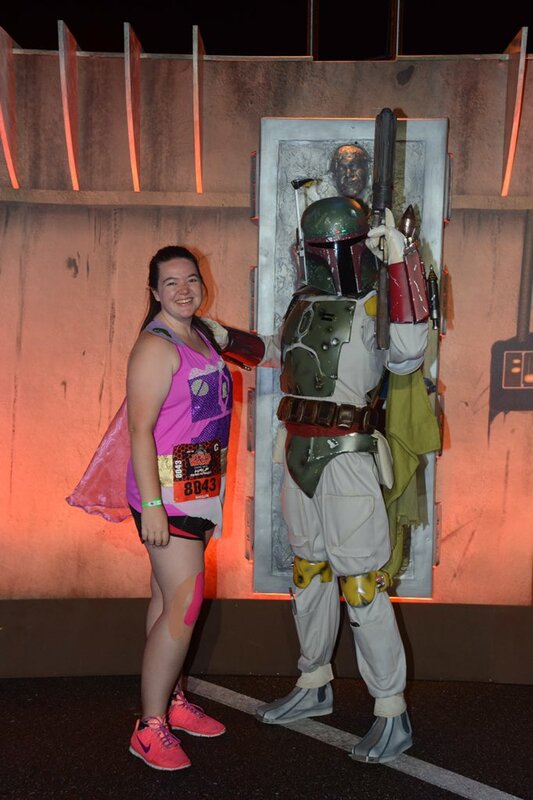 Overall, I love Star Wars Dark Side Half Marathon and would highly recommend it to anyone who is looking to run their first or 100th runDisney event! It's so fun and the atmosphere is way better than Princess Half or Wine and Dine. Let me know in the comments if you ran in this year's races, or if you want to in the future! Also be sure to follow me on Instagram to keep up with all of my Disney Adventures! Do You Really Need a Fancy Camera at the Disney Parks?